My name is Til, I'm Co-Founder and CEO of STF 3d GbR, and I really appreciate the opportunity to showcase some of our work here. We are a bunch of artists from Germany who want to bring photo-realistic content with excellent performance to UE4. Our goal is it to enable artists to achieve photo-realistic looks with UE4 at an affordable price. All our models come either with reasonable polycounts, or with several (meaning: up to seven!) LOD levels; our idea is to invest a bit more effort into the retopology process, so looks and performance will go hand in hand. 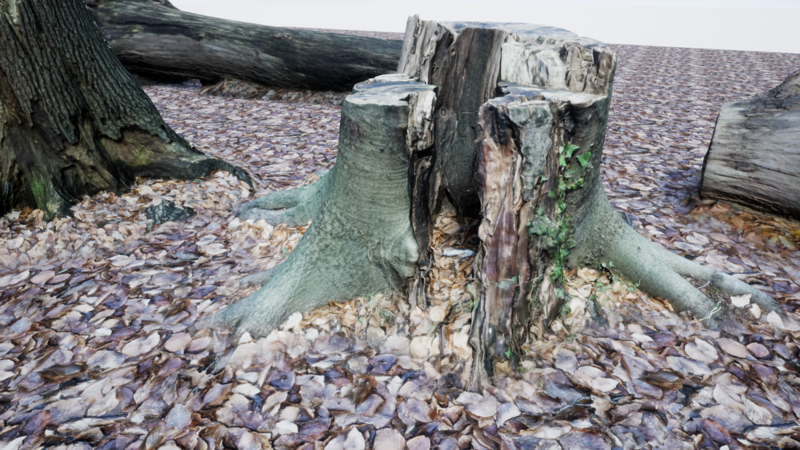 Our first product is a set of ten tree trunks / stumps that was mostly photo-scanned in northern Germany. It will soon be followed by a very large set of Southeast-Asian content which also contains photogrammetry assets, and by Summer, we want to be able to offer nature and architecture sets from Italy, France, Monaco and Spain as well.